On Wednesday, Israel announced the approval of 323 tenders for housing units in East Jerusalem, and plans to build 770 units in Gilo. While much of the international community considers Gilo a settlement, Israel considers it a neighborhood of annexed East Jerusalem and argues that it will be part of Israel in any negotiated peace agreement. Dulan abu-Saleh, the mayor of Majdal Shams, the largest Druze town in the Golan, told Makor Rishon that the UN Economic and Social Council’s recent statement on the area was “a total joke,” the daily reported Friday. Unlike other Druze populations in Israel who serve in the Israel Defense Forces, the Golan’s Druze population of some 20,000 has been careful not to align itself publicly with the Jewish state, which annexed the Golan Heights in 1981 after capturing it from Syria during the Six-Day War in 1967. A new report shows how the U.S. contributes more money to the U.N. than it spends on shipbuilding for the Navy, yet there is a huge disparity in what it receives back compared to many repressive countries. The United Nations recently released a report detailing the countries of registration of the recipient vendors of $17.6 billion the U.N. system spent on goods and services in 2015. The report received some modest attention in the press. However, the general unfamiliarity with the U.N. can lead to misunderstandings about what information this report was actually providing. For instance, a Forbes article misinterpreted the report as one listing which countries contribute most to the U.N. system. This misinterpretation inspired this article piece to illustrate the difference. Unfortunately, the U.N. system does not report its revenues as frequently as it does procurement. Analysis requires going back to 2013, which is the last year that both procurement and revenue data were published by the U.N. Chief Executives Board for Coordination. In 2013, the U.N. system procured $16.38 billion in goods and services (the summary page for procurement of goods says $16.1 billion, but the dataset yields the higher number) and (after eliminating duplicate information for Aruba, the “State of Palestine,” the Republic of Korea, and the Holy See) $53.9 billion in revenues from governments in 2013. In other words, in 2013 the U.N. system spent about 30 percent of the revenues received from governments on goods and services. An Arab father sends his three year old son to confront the Israeli border police, while shouting at the solders to "shoot the child". In addition, the Arab father urges his little son to throw rocks at the solders, but the youngster misunderstands and throws them sideways. Now do you understand what we are dealing with? Douglas Murray on BBC Radio Ulster arguing about the origins of Islamic violence. Belgian police arrested two men “suspected of planning an attack” in Belgium following raids late Friday ordered by an anti-terror judge, federal prosecutors said on Saturday. Belgium has remained on high alert following deadly March bombings claimed by the Islamic State group in Brussels and a wave of deadly attacks in the last month in France and Germany, some of them claimed by IS. The two men, identified as Noureddine H. and his brother Hamza H., were arrested following house searches in the French-speaking areas of Mons and Liege, a spokesman for the federal prosecutors said. “Both are suspected of planning a terrorist attack somewhere in Belgium,” the spokesman said in an English version of the statement. The French version referred to “planning attacks” in the plural. The prosecutor’s office said there was for now no connection with the bombings on March 22 at Brussels airport and a metro station near the European Union headquarters that left 32 people dead. A local mosque in the French town where an elderly priest was killed in a jihadist terror attack at a church on Tuesday has refused to hold a funeral service for one of the two terrorists who perpetrated the attack. The two, Adel Kermiche, 19 and Abdel Malik Nabil Petitjean, also 19, were killed by police after a standoff outside the church which they had stormed during morning mass. They took at least five people hostage before slitting the priest’s throat at the altar and leaving another person in a critical condition. The killing of 85-year-old Rev. Jacques Hamel as he celebrated morning Mass sent shockwaves around France and deeply touched many among the nation’s five million Muslims. The Islamic State group claimed responsibility for the attack, as well as the July 14 truck attack in Nice, where 84 people were killed by a man who plowed his truck down a seaside promenade. Writing in The Washington Post's Outlook section, University of Wisconsin law Prof. Asifa Quraishi-Landes's Op-Ed “Five Myths on Sharia” (June 26, 2016) offered an at times informative, but too often misleading commentary on Islamic law. Yet, this deflection fails to take into account that many of these countries, upon gaining freedom from European mandates and trusteeships, either kept such measures or adopted them after the fact. One strict enforcer of sharia law, Saudi Arabia, was never under direct European control. How can the Palestinians condemn the act of murdering an innocent Israeli, but label the murderer a martyr? During his most recent interview on prime time Hebrew news, in April, Palestinian Authority President Mahmoud Abbas set the stage for this question. Speaking directly to Israelis, Abbas spoke out against the hundreds of attacks against Israeli civilians since a spike in violence began in October 2015. And yet, he also insisted on referring to these attackers as martyrs, which Israelis argue is incitement to more violence and terrorism. “Once he is dead, he is a martyr,” Abbas said. But doesn’t that set a bad example for the next generation? the interviewer asked. “No, no,” Abbas answered, shaking his head — and they left it at that, with the question hanging. The Times of Israel met recently with Dr. Mahmoud Habbash, the supreme sharia judge in the Palestinian Authority and Abbas’s adviser on religious and Islamic affairs, to see if he could answer this question, as well as get his opinion on other pressing religious matters central to the Israeli-Palestinian conflict. The judge defined a martyr, or shahid in Arabic, as “anybody who has been killed in a war against non-Muslims.” He also said Palestinians are in an open “state of war” with the “Israeli occupation.” In the context of this state of war, he argued, any Palestinian killed as a result of it — whether directly or indirectly, whether an Israeli fundamentalist firebombed his home, or whether he attacked a soldier or a civilian, and yes, even if he was killed while stabbing to death a teenage Israeli girl in her bedroom as was the case of the murderer of 13-year-old Hallel Yaffa Ariel last month — is a “victim” of the conflict because his actions were a product of it. And therefore, said Habbash, he is a shahid. An initiative geared towards creating Palestinian unity is taking place in South Africa this week. A conflict resolution non-governmental organization, In Transition Initiative, is hosting Palestinians from across the political spectrum to “hammer out their differences and forge a common political vision for the future,” in partnership with the Institute for Palestine in South Africa, according to the Cape Times. This is the second intra-Palestinian dialogue to be organized by the NGO in the country this year. “No other country has invited us to engage in dialogue among ourselves; it is only to South Africa that we would go to do that,” Dr. Nabil Shaath, a senior Palestinian figure in Fatah and former chief negotiator for the Palestinians during peace talks with the Israelis, told Independent Media. Shaath was due to meet the Minister of International Relations and Co-operation Maite Nkoana-Mashabane, as well as Gwede Mantashe, secretary-general of the country’s ruling party, the African National Congress. Earth movers dig into sand dunes on land where once Jewish settlements stood — prime real estate that the Gaza Strip’s ruling Hamas group hopes will ease its worsening financial crisis. Hamas has begun handing out plots of the land to 40,000 civil servants loyal to the group, to make up for millions of dollars in salaries it owes them for the past two years. The land giveaway is the latest sign that Hamas is struggling financially after almost a decade of uncontested power in the coastal strip. Gazans grumble about lack of jobs, constant electricity shortages and a blockade imposed by Israel and Egypt that has confined the territory’s 1.8 million people to the tiny strip. The World Bank says unemployment is 38 percent. Since 2014, Hamas’s main problem has been a dire lack of cash amid Egypt’s clampdown on smuggling tunnels underneath Gaza’s border with Egypt’s Sinai Peninsula. Before the tunnels closed, Hamas earned millions of dollars from taxes on smuggled consumer goods, including subsidized Egyptian fuel. Oh, that cruel, cruel "siege". The mass media and social media are full of testimony claiming the "siege" of Gaza has prevented rebuilding and construction. The reality is quite different. 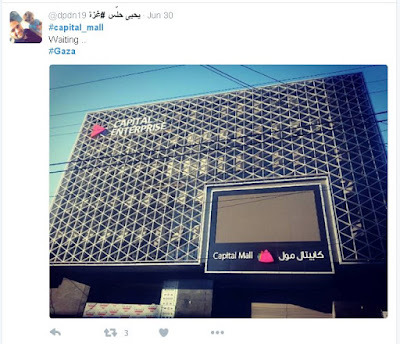 Gaza is anxiously awaiting the grand opening of its new "Capital mall"
It seems modern and quite luxurious. Its yet another snapshot from Gaza that you'll never see in the mainstream media, because it doesn't play into the Palestinian narrative of eternal victimhood. Among the social justice warriors of the hard left and the hard right, the Gaza as "open air prison" meme predominates. They paint a vision where a besieged people live a hard scrabble life among the rubble, completely cut off from the outside world. Its a false narrative. Just yesterday there were 1,085 crossings of foreigners, merchants and others between Gaza and Israel. Where are the merchants heading? Some are off to China. Dozens of Gaza merchants and businessmen are importing Chinese-made goods by traveling to China to buy products, ship them to an Israeli port and then deliver them to Gaza through Israeli-controlled crossing points. There are no official figures to show how big the scale of the import is. However, Maher Taba'a, the man who is in charge of public relations in Gaza Chamber of Commerce, told Xinhua that more than 50 percent of the general import of goods is coming from China. Highlighting some of these Chinese imports, the StarsCenter - an indoor amusement park has recently opened in Gaza, featuring bumper cars, rides and arcade games. He warned that recent public meetings between Saudis and Israelis — including a recent visit to Israel by a former Saudi general and a joint appearance of the kingdom’s prince and Jerusalem’s former national security adviser — were giving “a problematic and dangerous example” to other Arab nations. The Lebanese terror group Hezbollah said it will broadcast new footage showing the moments leading up to the 2006 cross-border raid into Israel, in which three soldiers were killed and two — Ehud Goldwasser and Eldad Regev — were captured. The raid sparked the 34-day Second Lebanon War where thousands of rockets fell mainly in northern Israel. 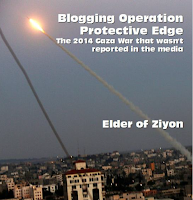 The war claimed the lives of 165 Israelis, including 44 civilians. Over 1,100 Lebanese, including both Hezbollah fighters and civilians, were killed. In a promo video released on the Hezbollah-affiliated al-Mayadeen TV station on Friday, the terror group said it prepared a three-part “documentary” on the reconnaissance preparations for the raid and the subsequent kidnapping. The first part of the “documentary” is set to air on Saturday. Mughniyeh was assassinated in Syria in 2008. A senior commander in the Syrian army recently escaped unharmed an Israeli assassination attempt in the Golan Heights, the Iranian semiofficial Fars news agency reported Friday. According to the report, the man in question is Majid Heymoud, who was visiting the town of Eastern al-Samdaniya. Heymoud's convoy, according to the report, came under two missile attacks in the part of the Golan Heights which is under Israel's control, but he escaped unharmed. The report did not specify when this incident took place. 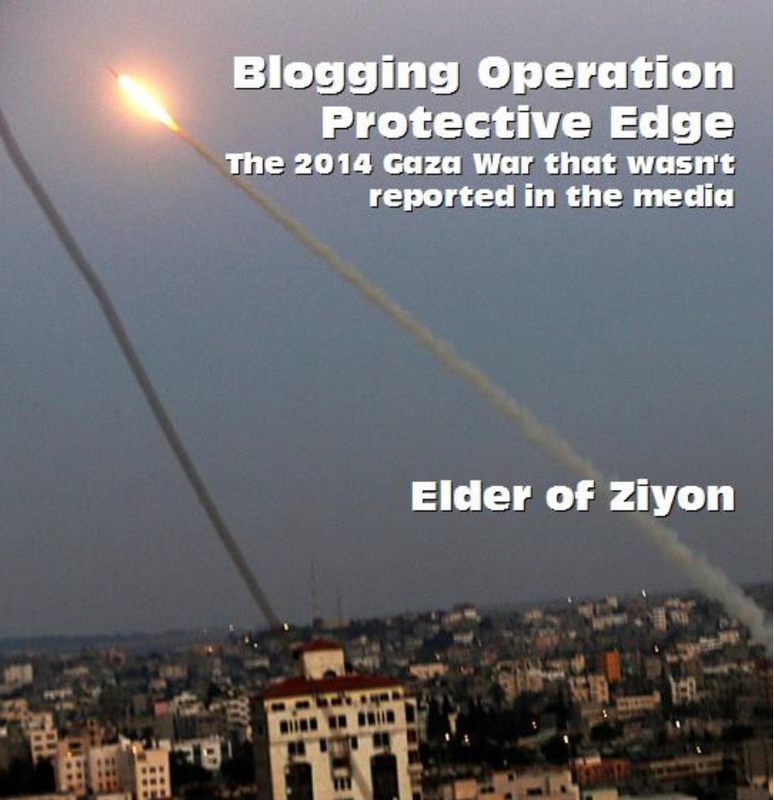 The IDF Spokesperson's Unit told Kol Yisrael radio on Friday that it does not respond to reports in foreign outlets. According to the Fars report, the Al-Nusra Front Syrian rebel group also tried to kill Heymoud after the alleged failed Israeli missile attack, but they did not succeed to do so. Iran was ranked as the world’s top global money laundering threat by the Basel Institute on Governance this week, marking the third straight year that the Islamic Republic held the position. According to the Journal, companies are hesitant to resume commercial ties with Iran because of money laundering concerns. Britain's vote to leave the European Union and the rise of U.S. presidential nominee Donald Trump have paralyzed efforts by Western governments to encourage already highly reluctant international banks to do business with Iran. Uncertainty is frustrating Tehran's push for foreign investment to revive its struggling economy: over Britain's political and economic future, over whether Trump - who wants to scrap a nuclear deal with Iran - will get into the White House, and over whether banks will fall foul of U.S. sanctions if they process transactions with the Islamic Republic. Under the deal, international financial sanctions on Iran were officially lifted in January this year and yet it has secured banking ties with only a limited number of smaller foreign institutions. One senior Iranian official said Tehran was examining alternatives. "Iran will continue to work with small banks, institutions as long as major European banks are reluctant to return to Iran," said the official. "Our estimation is that this uncertainty will continue for a few years. We are in talks with many countries, mainly China, Russia and African countries to widen our banking cooperation aimed at resolving existing banking, financial problems." U.S. banks are still forbidden to do business with Iran under domestic sanctions that remain in force. European lenders also face major problems, notably rules prohibiting transactions with Iran in dollars - the world's main business currency - from being processed through the U.S. financial system. Rasmea was released in a prisoner exchange in 1979 for an Israeli soldier captured in Lebanon. Rasmea eventually made her way to the U.S., where she lied on both her visa and naturalization applications, by falsely stating that she never was convicted of a crime or served time in prison. She told other lies as well, such as not disclosing the time she spent in Lebanon after release from Israeli prison, or that she was a military member of the terrorist Popular Front for the Liberation of Palestine. Rasmea became a U.S. citizen in 2004 on the basis of those lies. Nowhere does she recount the failure of Palestinian leaders to negotiate in good faith at Camp David in 2000, nor does she mention Yassir Arafat's refusal to accept the Clinton Parameters, which, if accepted, would have established a Palestinian state on all of the Gaza Strip and most of the West Bank and would have brought an end to the settlement construction she condemned. In her effort to portray Hamas as a legitimately elected government, Tarazi fails to include any reference to Hamas's deeply antisemitic ideology and well-documented calls for Israel's destruction and its support for Muslim supremacism over Christians in Gaza. How can a Catholic publication publish an article that ignores these issues? On New Years' Day, Israeli Arab Nashat Milhem opened fire in a Tel Aviv bar, killing Alon Bakal and Shimon Ruimi and injuring at least three others. During his flight from the killing scene, Milhem killed taxi driver Amin Shaaban, his third murder victim. 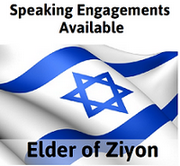 "After an Arab citizen attacked a Tel Aviv bar in January. 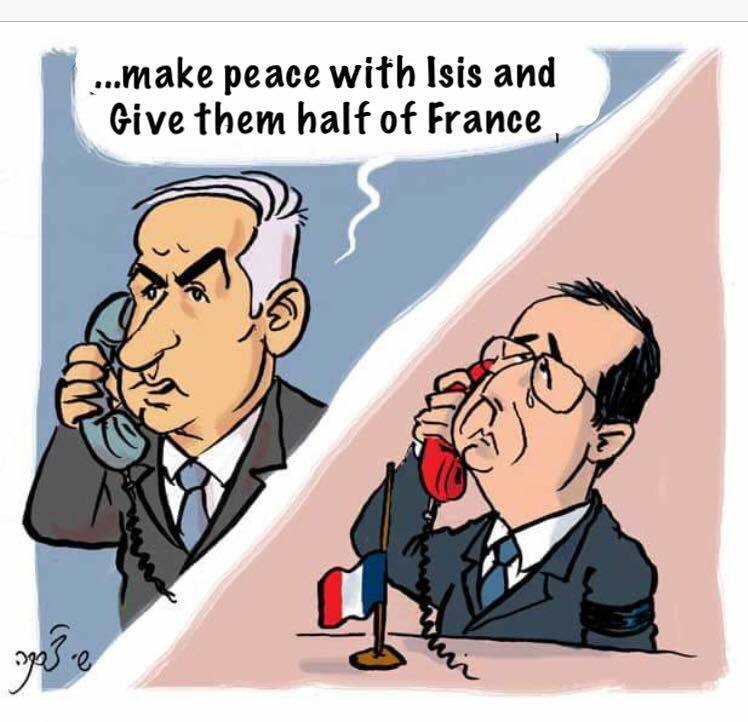 . . "
The assailant did not merely attack a Tel Aviv bar. He murdered three people, so why the obfuscation? The Israeli and American teams vying to win Google’s Lunar XPRIZE challenge have emerged as the competition’s two frontrunners, CNN reported on Tuesday. Thirty private teams from 16 countries initially entered the competition, which challenged participants to land a spacecraft on the moon, move it 500 meters in any direction, and send live high-definition video back to Earth. The competition began in 2007 as a way to open a new era of space exploration. The teams have until December 31, 2017 to complete their mission. The two main challengers still remaining — the Israeli team SpaceIL and the American team Moon Express — have scheduled launches for some time in 2017. The first team to complete the mission will receive a $20 million prize, though that’s a fraction of the total cost of building, launching, and landing a spacecraft on the moon. Accomplishing the mission could open a new era of commercial travel to the moon, Mars, or elsewhere, Privman said. Nearby, Brender Park, on the other side of Hyrcanus Street, features a large, movable menorah created by contemporary artist Yaakov Agam. Famous the world over for his kinetic and optic art, Agam produces interactive works that allow viewers to create their own abstract designs. Then, continuing on, streets are named for biblical figures – mainly prophets. Here, one enters the world of Bauhaus. In 2003, Tel Aviv was declared a World Heritage Site by the United Nations because of the predominance of Bauhaus architecture (a 1930’s style also called International) that originated in pre-Nazi Germany. Turns out that Tel Aviv has more buildings designed in Bauhaus than any other city in the world. Some of the houses on the streets here are slightly newer than the original 1930’s structures on Rothschild Boulevard, Ahad HaAm, Engel and Melchett streets in Tel Aviv. Nevertheless, they were influenced greatly by Bauhaus principles: the use of pure classical architecture without any kind of ornamentation, and the addition of flat roofs, smooth exteriors and geometric shapes. Others are completely eclectic: one, on the corner of Yehashua Ben Nun and Simon HaTarshi, features an unusual turret. Among the structures on Hagai, Amos and Ovadia streets are houses built on thick stilts – a Middle Eastern adaptation of the Bauhaus style. For when new immigrant architects who had been studying Bauhaus in Europe began designing in this country, they realized that they had to adapt their designs to a new climate and type of land.